You might remember my post mentioning my dryer and oven dying simultaneously. We already have chosen to go microwave free, so adding no oven to that mix felt disastrous at first! If I had leftovers to reheat I would pop them in the oven. Need to crisp something up? Oven. Baked ziti, lasagna, casserole, cornbread, muffins, french toast sticks. Oven, oven, oven. Needless to say I've had to improvise quite a bit. I actually reheated a slice of pizza on the stove. It worked out pretty well, I must say! Cheese was all melty, and the crust actually crisped back up! This has also meant that I've had to either eliminate or change-up certain family staples. Take lasagna for example. Can you possibly make a good lasagna with only your stovetop?? Before my oven catastrophe I would have said no, but now... YES! I stumbled across another phenomenal blog, a foodie blog called Mel's Kitchen Cafe, and I fell in love. 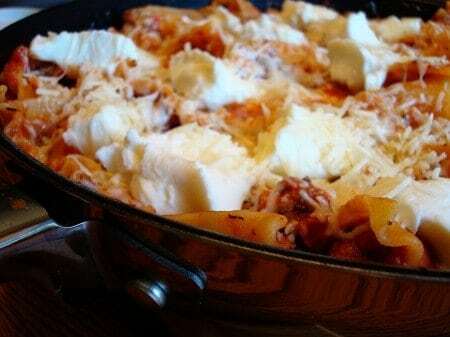 I've tried a handful of her recipes so far, and the Simple & Meaty Skillet Lasagna is one of our favorites. Not only is it just as good as lasagna from the oven, but the method in which it is cooked means that it takes no longer than a boxed dinner. But the health benefits of it being homemade, and being able to eliminate all the toxic additives to a boxed dinner, are unsurpassed. So enjoy the recipe! I did tweak it just a little, but that was simply to adjust the consistency to one more close to that of our family lasagna. The dots of ricotta throughout are simply heavenly! Make sure you use good quality ricotta! Bon appetite! Heat the olive oil in a large skillet over medium heat. Add the onion and cook until translucent. Stir in garlic and red pepper flakes and stir until the garlic becomes fragrant and pepper tickles your nose... less than a minute. Watch that the garlic doesn't start to brown or burn! Add the meat and stir to combine with the onion, garlic, and pepper. Brown until there is no pink left in the meat. Add the tomatoes and spices and stir everything to combine. Add the broken lasagna noodles, stir again, and bump the heat up to medium-high. Stir often and cook until the pasta is al dente. Remove pan from the heat and stir in half the mozzarella and parm, drop dollops of the ricotta all over the pan, and sprinkle with the remaining mozzarella and parm. Serve and enjoy! I'm so glad you liked this recipe! It is one of our favorites, too, and I can imagine how it would come in handy with no oven.